The birth of Lord Rama is marked by the celebration of Sri Rama Navami that falls on 9th day of the Chaitra month (March-April) according to Hindu calendar. Rama Navami is one of the most important of all Hindu festivals, as Lord Rama is known to be the seventh Human Avatar of Lord Vishnu. 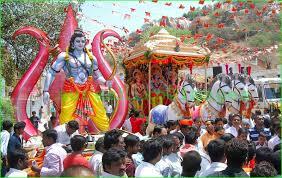 The nine day festival is sometimes also known as Sri Rama Navaratra. Devotees read the Ramayana and chant the holy the name of Lord Rama. Hindus also fast for nine days and “Ramcharitmanas” is recited at various places.